alegre como antes era yo. qué está en la oscuridad. 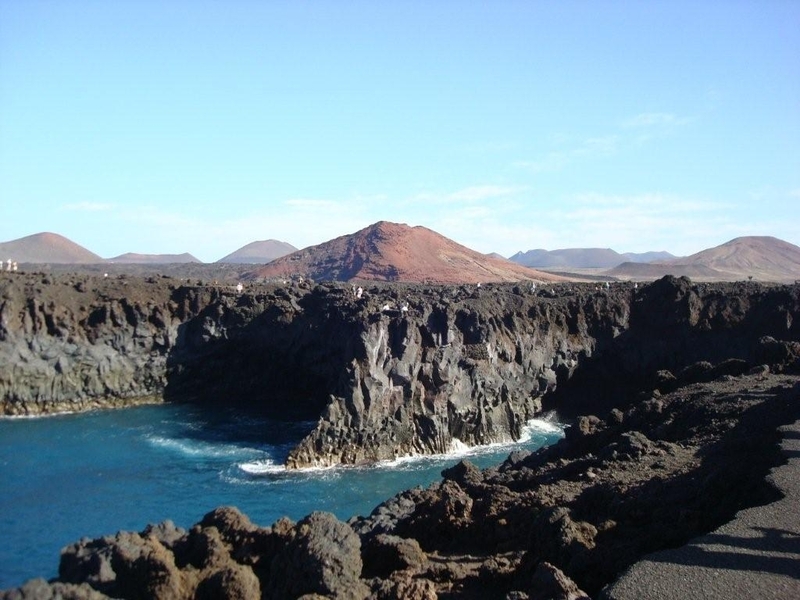 The most north-easterly of the ‘Fortunate Isles’, as the Canaries were originally named, only 125 kilometres from the African Continent and 795 km2 in size, Lanzarote with over 300 volcanoes is quite unique. Sculpted by the great volcanic eruptions of the 18th Century, from 1730 to 1736, the earth spat fire almost continuously, the lava buried a third of the entire island, whole villages disappeared and what had once been fertile land was covered by lava. This was the birth of the ‘Montañas de Fuego’ (Fire Mountains) – in six years of eruptions more than 100 volcanoes rose up. Amazed to wake up to rain on our first morning in Lanzarote, the only downpour they’d had in a couple of years apparently, we decided to spend the day lazily exploring Puerto Del Carmen, one of the three main resorts on the island. It is a lively spot, with its many restaurants stretched out along the promenade. 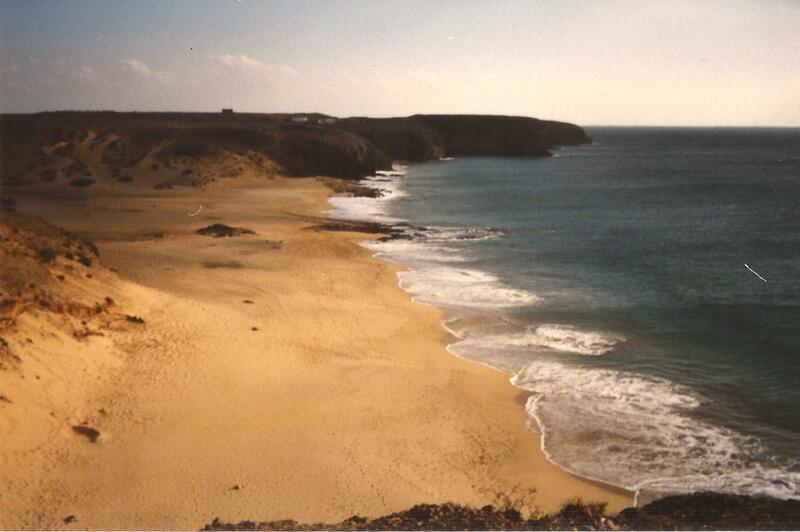 The marvellous, quieter, long, golden sandy beaches of Las Pocillas and Matagorda are lovely for strolling along, which I did most mornings, rounding the headland to the busier main beaches and coves, down to the little harbour with its seafood restaurants. The second day saw us heading for Fire Mountains in a hired car; the island has good roads and is easy to drive around. Timanfaya, declared a National Park in 1968, is quite an experience. Winding our way to the summit the view over the lunar landscape is awesome, with dusty-red volcano cones disappearing into the horizon. ‘El Diablo’, (The Devil) is a restaurant at the very top where meats are grilled on a barbecue, over a shaft, with the heat rising from the volcano burning deep below. Intrigued by a group of people watching a man pouring water down a tube protruding from the earth, I sauntered nearer, after a few seconds water vapour spurted up at great pressure showering us all. He then proceeded to throw some brush into a crevice where it burst into flames immediately; the temperature at a depth of only 60 cm is over 400 degrees Centigrade. Gravel from the surface was handed round but it was too hot to handle. Descending by a different route, a train of dromedaries came into sight so, deciding to do the full tourist thing for once, my partner and I had a camel ride over the volcanoes, which turned out to be hilarious. Charco Verde was our next destination. 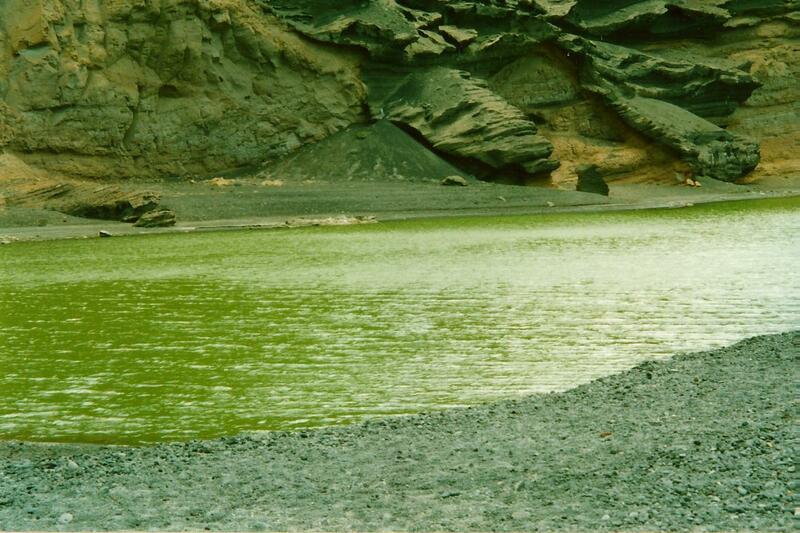 Below towering cliffs an emerald green lake lies in a volcanic crater, a black sandbank separating it from the ocean, its colour deriving from the reflection of tiny olivine stones, a semi precious gem popular in Lanzarote jewellery. Further along the coast ‘Los Hervideros’ is a fascinating sight, pathways weave across cliff tops. Centuries of waves have eroded ebony lava into fantastically shaped arches and underwater cave, the sea seething, hissing and bubbling away just like a cauldron. Continuing south, Salinas de Janubio, a lagoon worked as salt lakes, dotted with windmills, is so unlike the ones seen on the mainland, the black shingle beach contrasting with the white mounds of salt. Playa Blanca is a growing resort on the southern tip of Lanzarote with the neighbouring island of Fuerteventura plain to see just a short ferry trip away. The whitewashed hotels are only two storeys high, as are all the constructions on Lanzarote and appear quite luxurious, while the seafront and quay still maintain charm and atmosphere. Close by and accessible by dirt track is the ecologically protected Papagaya Bay. A series of seven fine, white, sandy bays, surrounded by rolling sand dunes; the calm, crystal clear waters are made for bathing in. My partner tried very hard, without success, to make me believe there was smoke coming from the distant volcanoes! 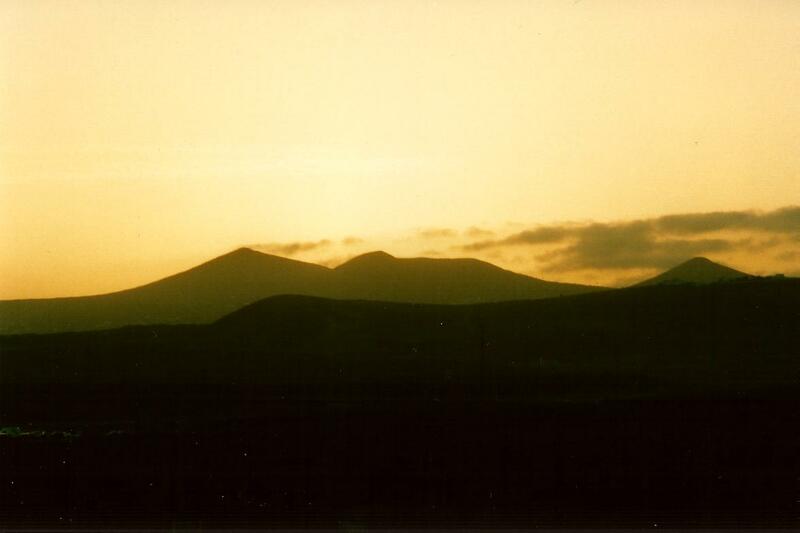 Lanzarote has a beauty of its own. The villages scattered over the island have low, whitewashed dwellings where the folk traditionally make a living from the land. 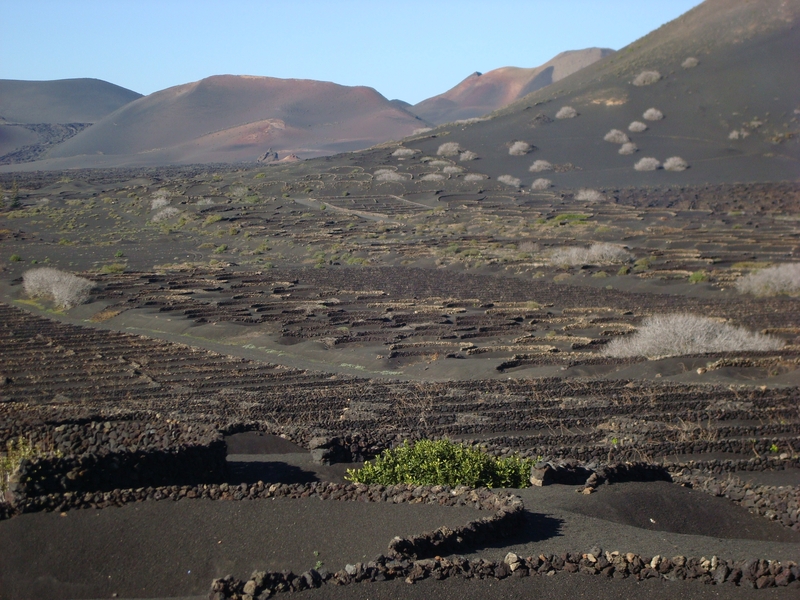 Incredible to see the way volcanic ashes are used to cultivate crops such as the small Canary potatoes, large juicy melons and grapes to name just a few. Each vine has a circle of black rock for protection against the wind. The humidity from the morning dew is retained, as there is very little rain and no natural water source for irrigation. The resulting wine is excellent, the local goats’ cheese is also delicious – my favourite being a semi-cured one with a paprika coating. On the western side of the island, where the seas have stronger currents, lies the hamlet of Famara. 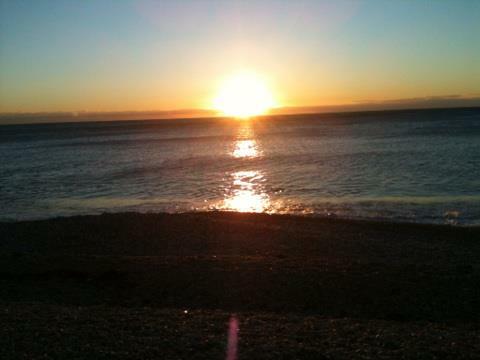 Its unpaved streets, lost in time, minute harbour and immense windswept beach is a favourite of surfers. Driving past a ridge of low mountains that line the wide, barren valley, dozens of hang gliders came into sight. To the north, the higher part of the island becomes somewhat greener. Mirador del Rio deserves a visit, a building designed by the sculptor Cesar Manrique, it has panoramic views of the islands of La Graciosa and Alegranza. On the eastern coast, not far from our holiday base in Puerto Del Carmen, is Arrecife, the capital city. It has a large port, castle, fort and loads of history of invading pirates. Further north passing Costa Teguise, where the King of Spain has a family home, the volcanic rock takes on a greenish hue. Next stop was Cueva de los Verdes, a volcanic tunnel connecting numerous caves, mostly unexplored. A guide showed a group of us around, and we finally discovered the secret, a ‘vision’ I’d heard about but that none tell… By the sea, an extension of the same volcanic tunnel, are the caves of Jameos Del Agua. An underground lake here is the habitat of diminutive, white, blind crab. It has a natural auditorium with perfect acoustics where musical concerts are held, designed and recreated once again more by Manrique. The volcano museum housed here is also fascinating. So, back to Puerto Del Carmen and another evening out, strolling along the seafront, watching the chefs flambéing their specialties, making the difficult decision of which restaurant to enter tonight. A personal choice between a juicy steak in an appetising sauce, an awesome Lanzarote pizza with goats’ cheese and dates, and a hundred other tempting dishes… flambéed strawberries or bananas? Then on to a cocktail bar to sample another exotic drink and watch the world go by. What a hard life this is! There are direct flights from Madrid to Lanzarote daily; check local flights from Tenerife if you’re island hopping!